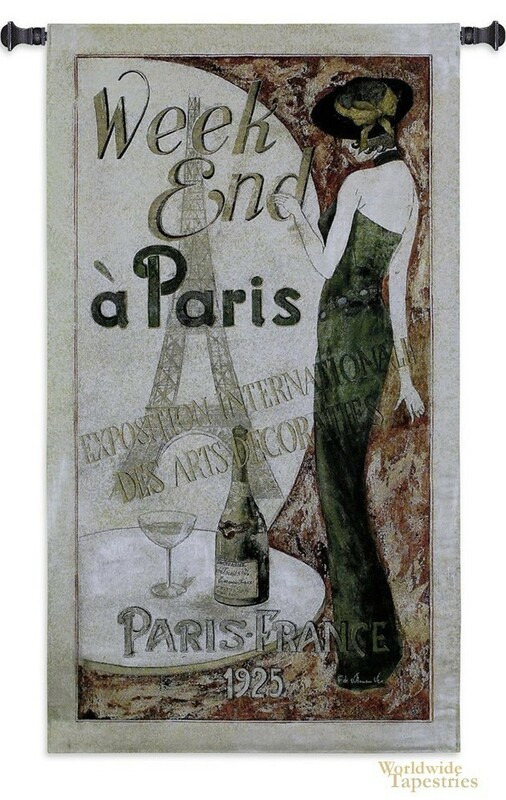 A tapestry showing "A Weekend In Paris" poster from 1925. This tapestry is dedicated to the 1925 International Exhibition of Decorative Arts where the best of the best in interior decor and art gather in Paris for a weekend. It was also an era here elegance of dress was the theme and the norm of the day. Not just nicely dressed but adorned in clothes that we would consider for special occasions nowadays. Here we see a Parisian woman in green and a fashionable hat, near of course a bottle of champagne. The decorative arts had a special place in Paris, a place where art and the luxuries of life have great importance in their culture. This tapestry is backed with lining and a tunnel for easy hanging. Note: Tapestry rods and tassels, where pictured, are not included in the price. Dimensions: W 30" x H 53"